The Mk 19 (or Mark 19) is a grenade machine gun capable of firing one grenade every second at a maximum range of 1,200 metres (3,900 ft). The Mk 19 fires 40mm grenades at a rate of 325-375 rounds per minute (rpm). It has a maximum effective range of 2,212 metres (7,257 ft). It was originally used by the U.S. Navy in Vietnam for river patrol boats. Later it was adopted and improved upon by the U.S. Army. 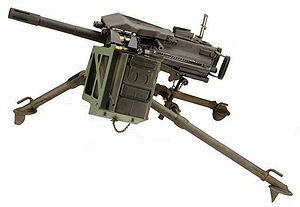 It is a man portable crew-served weapon that can fire from a tripod mounted position. It also fires from a vehicle mounted position (this is the preferred method since the weapon alone weighs 75 pounds (34 kg)). The ammunition comes in 32 or 48 round ammunition boxes weighing 42 pounds (19 kg) and 60 pounds (27 kg). ↑ 1.0 1.1 1.2 1.3 1.4 1.5 1.6 Jones, Richard D. Jane's Infantry Weapons 2009/2010. Jane's Information Group; 35 edition (January 27, 2009). ISBN 978-0-7106-2869-5. ↑ "Bangladesh Navy Special Warfare Diving And Salvage (SWADS)". Bdmilitary.com. Retrieved 2012-11-24. ↑ "Corpo de Fuzileiros Navais adquire 23 novos CLAnfs - Noticias Infodefensa América". infodefensa.com. 2 April 2014. Retrieved 4 November 2016. ↑ 4.0 4.1 "A new generation of AGLs". Thefreelibrary.com. 2002-04-01. Retrieved 2012-11-24. ↑ "Greece Land Forces". Armyrecognition.com. Retrieved 2012-11-24. ↑ "Great Prophet 5 Maneuvers (5)". uskowioniran.com. Retrieved 4 November 2016. ↑ "ARW Operator manning a MK19 on a Long Range Patrol Vehicle". 4 January 2010. Flickr. Retrieved 14 May 2014. ↑ Miles, Donna (April 8, 2009). "Gates, Lebanese Defense Minister Explore Expanding Bilateral Relationship". American Forces Press Service - DefenseLink News. Retrieved 2009-04-08. ↑ "Saco Mk 19 AGL 40mm Automatic Grenade Launcher (AGL) (1967)". MilitaryFactory.com. Retrieved 9 November 2016. ↑ Janq Designs. "Special Operations.Com". Special Operations.Com. Retrieved 2012-11-24. ↑ Henrik Svensk. "Granatspruta 40mm Grsp". Soldf.com. Retrieved 2012-11-24. ↑ "Report: Profiling the Small Arms Industry - World Policy Institute - Research Project". World Policy Institute. November 2000. Retrieved 2010-07-15. ↑ "MKEK - Makina ve Kimya Endüstrisi Kurumu". mkek.gov.tr. Retrieved 4 November 2016. ↑ "Sayfa bulunamadi". anahaberyorum.com. Retrieved 5 November 2016.